All the way back in 2007, soon after I acquired my very first DSLR digital camera, I shot photos of my first lunar eclipse. I don’t remember if I had seen one prior to that, but on August 28th 2007 I took my best shot with my trusty Canon 20d and a 70-200mm F4 lens I borrowed from a friend. It occurred at 3am, and from the rooftop of my work I captured the zoomed in view as much as I could manage. Check out the photo at the bottom of this post. Lunar eclipses are cool, but it was the beginning of the realization that to really take a more interesting eclipse photo, you need a foreground. This is problematic if the eclipse happens high in the sky. Scroll down for a moment and check out the wide view of the same eclipse. A uninteresting photo of nighttime Santa Monica and a teeny tiny little red eclipsed moon above. This is precisely the kind of photo that many people take the 200mm moon and slap it into this scene and try to say that’s what it looked like. Which, aside from being dishonest, looks awful. It’s much more fun and challenging to do things in-camera. Optically. Realistically. Fake is utterly boring, and I say this as someone who is literally a professional compositor. Please don’t ever enlarge the moon. So anyway, after looking at the wide view the quest began for any future eclipse to attempt to find some kind of foreground to go with it. Fast forward all the way to 2019, and I was brainstorming on what I could try to align with the 2019 eclipse. Like that eclipse 12 years ago, this eclipse was going to happen high in the sky. My mind wandered as I scoured Google Earth, racking my brain for any kind of idea of something interesting. The most recent lunar eclipse happened on January 31st, 2018. For that eclipse the best I could come up with was to try to capture an airplane on approach to LAX in front of it, but alas that was unsuccessful. I didn’t want to repeat what happened in 2018. And then an old photo popped into my head. It was from the same day in 2012 that I had dropped off the 97 Switchbacks at Night to be be on display behind the permit counter at the Eastern Sierra Interagency Visitor Center. My best friend and I wandered over to the Alabama Hills and hiked around finding arches. We found the Eye of Alabama arch and hiked up to take a look. It was in the middle of the afternoon and the moon was high in the eastern sky. While we were there at the arch, I realized I could frame the moon with it. I wondered if the eclipse would align like that? What would that look like? I browsed back to see what time of day precisely that I took that photo. Then I looked up how high precisely the moon was then in the sky. Knowing that was an alignment that worked, I then looked up the same data for the January 20th 2019 lunar eclipse. To my delight, it suggested that indeed the eclipse would be visible at roughly the same height! Barring some other better idea or weather failure, I resolved to do try this and see what happens. As much planning as I could do using the amazing tools like Google Earth, there’s no substitute for being there. Fortunately, the eclipse was on a Sunday night, so I arrived a day early to scout out what I was going to do. I did this even though the weather forecast had turned rather grim. The forecast for Saturday night was mostly cloudy, and the forecast for Sunday night was 40% chance of rain with 20+ mph sustained winds and 40mph gusts. That’s a pretty awful forecast for a lunar eclipse requiring long exposures. Tripods are great but they are no real defense against that kind of wind onslaught. During the afternoon I went up and visited the arch that I had not visited since that visit 7 years prior. 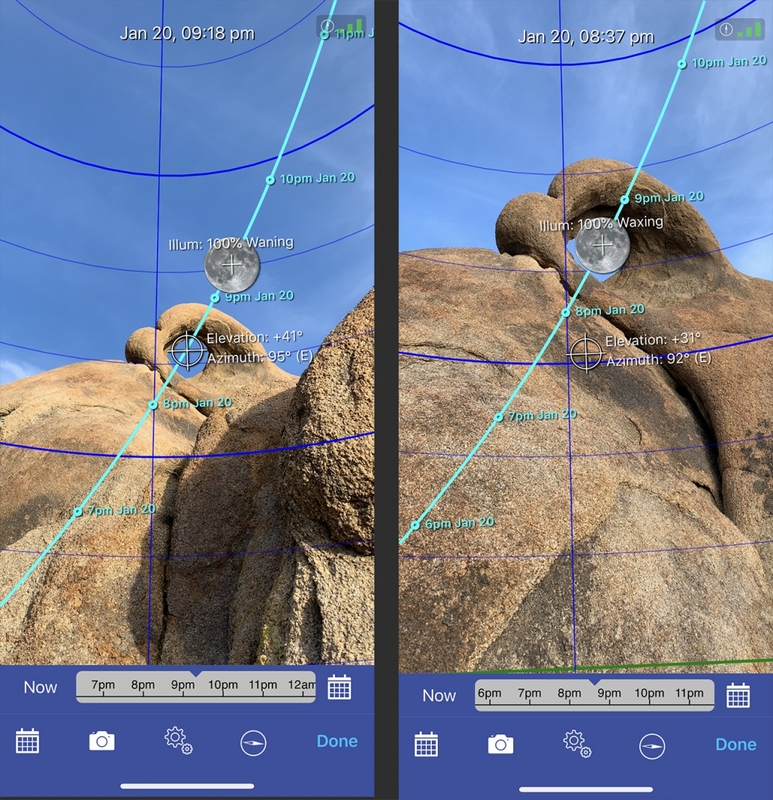 I pulled out my phone and fired up the app Moon Seeker, which uses AR (augmented reality) to overlay the moon position onto the phone’s camera view in real time. You can dial in a time of day and see where the moon will be at that time at your geographical location. Standing below the arch, I dialed in maximum eclipse. Looking good! As a sort of rehearsal, I endeavored to return at night to practice shooting the moon through the arch. This would truly answer the question as to whether all of the planning would work out. The moon the night before moves in a nearly identical path but about one hour earlier. So with the peak of the eclipse happening at 9:16 the moon would be in roughly the same position the night before at 8:16. The sky remained cloudy all day but with just thin clouds. These clouds proved to be no match for the illuminating power of the full moon which easily cut through with the added benefit of producing a moon halo as the light from the moon refracts to form a huge bright circle in the sky where the ice crystals are present. While experimenting with various exposures, I produced this wide shot. I stopped the lens way down to maximize the star pattern of the flare. Looking at this result, I was elated. Even if the lunar eclipse shot fails, at least I have this image, and it is a keeper. I went to bed knowing a long day was ahead. After numerous wanderings around the Fossil Falls area, the Alabama Hills, and a stop at Copper Top BBQ in Big Pine for lunch, I returned to a cloudy Alabama Hills for the main event. I parked just off the road and shot photos of the sunset behind Mount Whitney and then waited. 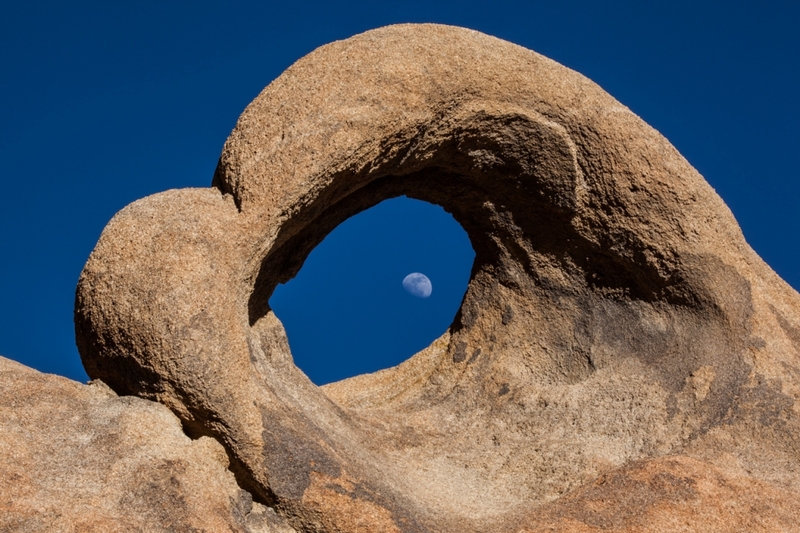 The Alabama Hills are a popular place, and there were numerous other photographers around. Several of them were quite close. I set up a wide view time lapse camera nearby and kept waiting for the cover of night. I really was weary that someone might try to copy me if they saw what I was up to. Despite the abysmal forecast, the conditions at this time were perfect. There was no wind, and there were very few clouds. In the dark using only the moonlight I hiked my cameras up to the arch to try to set up as much as I could ahead of time. I then wandered back to my car and listened to some music and podcasts to help pass the time. At 7pm, the wind turned on as if someone flicked a switch. It went from totally calm to gusty, and I started to realize the forecast wasn’t quite as wrong as I hoped. To the north I could see that the sort of invisible force filed that was containing the precipitation to the ridge line was breaking down and rain (and wind) were spreading into the valley a bit. I hoped it would hold off. Looking above a small thin cloud had grown into a large flat dense one obscuring the moon. Effectively the cloud was blocking a view for the eclipse for all of Lone Pine and the Alabama Hills. Here is the view from the arch looking west. You can see the bright moonlight on all of the Sierras and a deep black shadow on all the Alabama Hills. Short time lapse showing the eclipse blocking cloud from Kurt Lawson on Vimeo. In the end, the cloud relented *just* in time. The narrow window of time for the eclipse to be visible inside the arch was about 10 minutes. And so during those 10 minutes I frantically took as many shots as I could. The wind was very gusty, and despite my large heavy tripod, getting a totally stable shot was difficult. A distant car provided some unexpected light painting during some of the shots. And the cloud hiding and revealing the moon caused some shots to have a sort of double exposure effect where the moon had moved a bit while it was obscured. All of these are single exposures with no blending between frames. Certain impracticalities like bumping the tripod and the laws of physics made an in-focus arch impossible to go along with the in focus moon. I decided to focus on the moon and stars anyway since I originally expected the arch to silhouette entirely. In the daytime image from 2012 of the arch with the moon behind, I had my lens stopped down to f/32 to achieve a somewhat in focus moon with the in focus arch. F/32 would never work for a night image. Finally, the main image, which I actually drove into Lone Pine and sat on my laptop processing and then posting (before the eclipse was fully over). My processing in Lightroom was simple. It’s just Exposure +1.35, Highlights -56, Shadows +60, Blacks +100, and a tonal curve to control the way the shadows roll down and a white balance adjustment. That’s it! So there you have it. It actually worked out. After I moved my main cameras back to my car and shot a couple of telephoto shots of the eclipsed moon for good measure, I felt a rain drop. And then another. I quickly gathered all my gear up and called it a night as far as shooting goes. I was exhausted. Check out some of my photos from past Lunar Eclipse shoots, starting with the two boring shots of the 2007 eclipse over Santa Monica. The red moon is neat, but what about all that black space. Wouldn’t it be great to do something with that? Tiny little red moon over city. How long would it take for people to really realize this photo includes an eclipsed moon? And finally in January 2017, after failing to get a plane in front of the eclipsed moon, I once again just took a shot of the clear sky blood red moon because it’s neat and why not. I was up with my gear anyway.